Here’s an interesting puzzle. 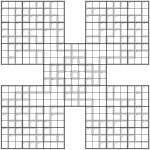 It’s a 5-grid Samurai Killer CalcuDoku, which means that it has the 3×3 boxes from Killer Sudoku but otherwise works like a CalcuDoku puzzle, albeit a 5-grid Samurai one! All of the operations in this puzzle are addition, so aren’t shown. Can you place 1 to 9 into each row, column and 3×3 box of each of the underlying 9×9 Sudoku grids, whilst also placing numbers so that each inner cage adds up to the total given at its top-left corner? Numbers can be repeated within these cages (pretty obviously, given how large some of them are!). There are quite a lot of single digit cells, suggesting (truthfully) that this isn’t actually a very difficult puzzle – but it’s a good proof of concept, I think. You can create really huge cages if you want, without making the puzzle difficult (of course, the easiest way to solve these is to essentially ignore the cage completely, or at least until it is nearly finished). This particular puzzle does not require you to do any complex maths at all. This entry was posted by Gareth Moore on May 4, 2009, and is filed under CalcuDoku, Killer CalcuDoku, Killer Sudoku Variants, Samurai, Samurai Variants, Sudoku, Sudoku Variants. Follow any responses to this post through RSS 2.0. You can leave a response or trackback from your own site. Pretty simple puzzle. I really like killer sudoku and would like to see one of these with no singles and no repeated digits in cages. I see one of the challenges in designing a puzzle like this is having people need to use more than one puzzle area to crack it. I found with this one that I could do each part separate and join them at the end. With most samurai, you are forced to hop between puzzle areas.